Artificial Intelligence can be used to help streamline, speed up, and make more efficient many aspects of the job search and hiring process. Will your next interview be conducted by a robot? Will you use AI technologies to help you find your next employee or screen potential job candidates? We think that’s just around the corner, if not already here today. 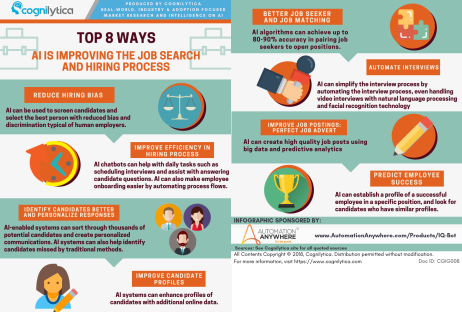 In this infographic Cognilytica explores 8 different ways in which AI is improving the job search and hiring process. Automation Anywhere Enterprise is a Robotic Process Automation (RPA) and intelligent digital workforce platform that comes built-in with cognitive capabilities and real-time analytics. It is the world’s most widely deployed platform at 1100+ enterprises in 90+ countries delivering 650,000+ digital workers. Businesses can design, develop and deploy software robots (bots) to automate repetitive business processes with 100% accuracy, dramatically reducing operational costs and significantly increasing productivity. An embedded analytics engine delivers real-time operational and business insights with the help of interactive dashboards. With AI and machine learning techniques, it can process structured and unstructured data to deliver the most accurate automation. IQ Bot is a cognitive solution that leverages AI to learn from human behavior and to bring structure to unstructured data. IQ Bot leverages Computer Vision (CV), Natural Language Processing (NLP), and Machine Learning (ML) to detect critical hidden information and structures it in ways that can be processed by other bots and applications to dramatically reduce the need for human involvement.